How do I read a "wordless" storybook to my children? Then, if I figure that out, will they even like a storybook without words? Historically, I have avoided these questions by quickly placing this type of book back on the library shelf. Even as a teacher, I wasn't willing to buy into the hype that wordless books are great for reluctant readers and writers. It was time to "experiment," as I told my children, with wordless books as we celebrated David Wiesner's birthday this week. "The more ambiguous the problem, the more he liked it, and the better it served his inventive mind," said David Macaulay, one of David Wiesner's teachers at Rhode Island School Design. David Wiesner went on to publish over 20 books for children including three Caldecott Medal winners and two honor books. At the center of these books is Wiesner's imagination and illustrations, both of which have been with him since childhood when he would create "wordless comic books, such as Slop the Wonder Pig, and silent films like his kung-fu vampire film, The Saga of Butchula." (Houghton-Mifflin). Later, these imagination and illustrations started to take the form as wordless stories with his senior degree project that was "a 48-page, wordless picture book where I took a story by fantasy writer Fritz Lieber and told it in wordless format. It was an incredible learning experience." (Bookpage). David Wiesner's first Caldecott Medal came in 1992 for Tuesday that stemmed from a magazine cover he designed for Cricket Magazine.It is considered a wordless book even though there are a few words that establish a timeline throughout the book. Before reading this book we had already experienced Wiesner's other Caldecott winners, The Three Pigs and Flotsam. 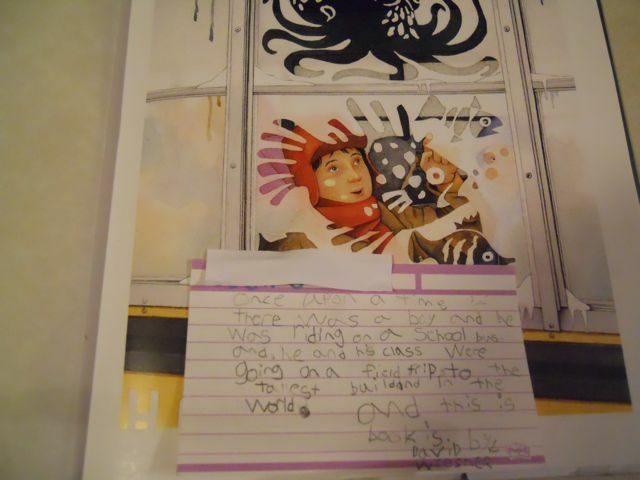 I "read" the books to my children by orally adding words to the pictures without text. However, I wanted to give them the opportunity to tell the story of a wordless book. I told them we were going to "experiment" by videotaping each of us reading Tuesday and then watching the recording to see how our stories were similar. First, I was shocked that they were excited to do this, maybe it was because I used the word "experiment". Or maybe it was a clue to something important I had missed about wordless picture storybooks. My daughter told a story of a frogs that began to fly on lily pads into the "shadows" and "over the city". My son commented "Look at that frog. It's upside down." and "The frogs are chasing a dog." I was impressed at their ability to pull something meaningful from each page. The coolest part was when the story was finished they both were able to retell the story with a beginning, middle, and end. To conclude the activity I asked them both what they thought of reading the book. My daughter said, "It was weird, because I have only read books with words." My son replied, "Cool." I think my daughter's reaction of "weird" is very reasonable. From her viewpoint "Books have words and I like to read them." It is a little "weird" and sometimes difficult to analyze a picture, derive meaning, and orally tell the story. Later in the day, my daughter asked for another activity so I suggested writing the words for a David Wiesner story. I gave her post-it notes to then place her words in the book. This idea came from the blog Together Time 4 Families. She chose the book Sector 7 (Caldecott Honor Book) , which was one of our favorites by David Wiesner, for this activity. I feel more confident "reading" a wordless book to my children; generating words to orally tell a story that matches the pictures. 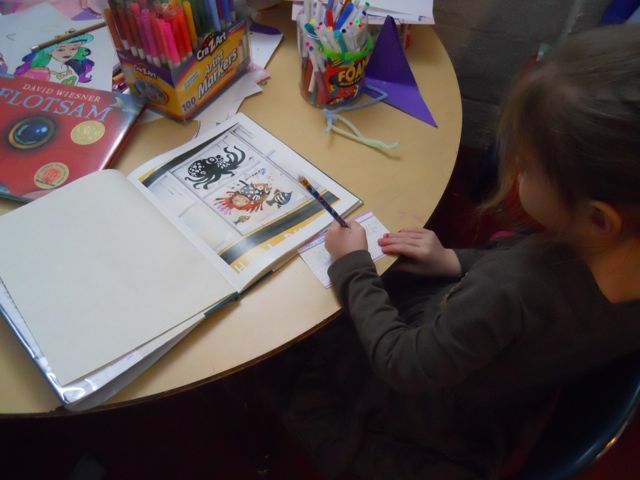 Additionally, I know my children enjoyed the activities of reading and writing along with the books by themselves. This was excellent learning "experiment" for our family this week. I learned that book by David Wiesner is a perfect author to check out if your family has never experienced wordless books. Also, I learned that I should no longer be apprehensive about wordless books. Just because they don't have words, doesn't mean they do not have a story to tell. Many of David Wiesner's books were added to our list for the Picture Book Reading Challenge sponsored by There's a Book! Click Here to see what else we have been reading! David Wiesner is an incredibly talented author/illustrator. The details in his pictures are fantastic. Flotsam is one of my son's favorite books. We like to make up our own stories about some of the things in the pictures. It's a new adventure every time. Wordless books -- I have never attempted reading such a thing, but you've given me the impetus to do so! I love the way you engaged your kids in exploring the books and experimenting with them. Art and Max is on my list to be reviewed for the Read-to-Me Picture Book Reading Challenge... I must get to it soon! What a wonderful idea to celebrate authors on their birthdays! 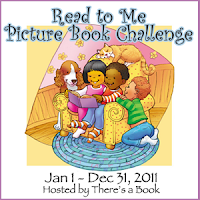 I'm so glad that the Read-to-Me challenge led me to your blog! Hope you can come and visit again, and we'd definitely check out the other titles you have over here. Oh how I love David Wiesner. Sector 7 is one of our favorites. His books take us back to traditional storytelling. You can highlight different elements in the retelling each time. I also like "You Can't Take a Balloon Into the National Gallery" by Jacqueline Preiss Weitzmann, another wordless book. 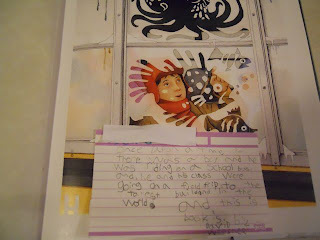 Kirsten, I love this "You can highlight different elements in the retelling each time." I never thought of that as a positive element of wordless books. I love it! Thanks so much for sharing.